Want to just dive into the World Cup interactive data search experience?, have fun! The 2014 World Cup starts today in Brazil, with the host country kicking off against Croatia in what should be the biggest sporting event in history. The World Cup is generally the largest watched and talked about event whenever it comes around every four year, but this one is special. This year, many people around the world have the ability to interact with the World Cup like never before. Twitter, Facebook, live streaming, cheaper access to TV and internet allow people to participate by sharing their thoughts and overall roller coaster journey of emotions as they see their favorite team(s) challenge for the most coveted trophy in the world. Not only has technology improved to allow people to share through social media and watch games through various channels, but it has also allowed for richer insights into the data itself. Business intelligence, or more plainly, data analysis has improved greatly in 4 years. With that, Microsoft proudly introduced PowerBI Q&A back February 2014, a natural language query experience which some of you may or may not be familiar with. Rather than trying to explain what it does through lengthy gibberish, let’s follow Q&A through its emotional roller coaster as it works to uncover meaningful insight about players, teams, coaches, referees, and everything in between. 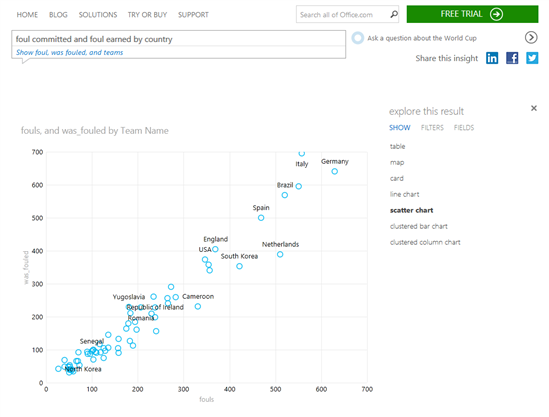 Our Dataset: Historical data from the 1990-2010 World Cup. Provided by Opta Sports Ltd.
We have data from the 1990-2010 world cups ranging from player statistics, team statistics, managers, and referees, to which stadium each game was played in and its attendance. Let’s go through a Q&A experience and answer some questions about world cup statistics people will have. Make sure to go through the guided preview first to see what kind of questions and visuals we can show through Q&A. We will be adding more statistics for teams and players, as well as ways to talk about those statistics. (ex. An aggressive team is a team that fouls a lot. A reckless team is a team that fouls a lot and gets a lot of bookings.) If there are certain statistics that you really want to see, post a comment below. Another great feature of Q&A is that we know what questions you are asking that we aren’t answering correctly. So each week, check back to see if those questions that weren’t previously working are working now. This perfectly highlights the communication between a model creator and the end user. Sometimes Q&A won’t get every answer correct, but we can identify which ones aren’t working and ensure that they do. If there are excitements and frustrations you want to express, please leave a comment below. Let us show you how Q&A works: Type a question and get your answer as an interactive chart. That’s it. No more instructions necessary to start. As you start this experience, we have predefined a few questions in the model for you to try out. 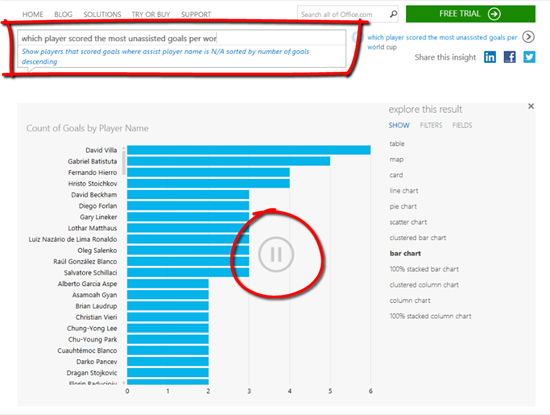 For example: which player scored the most unassisted goals per world cup? Also, while a question is being typed (by you or by our preloaded questions) you also get recommendations on different types of questions you can ask based on the data behind the model and what is being typed. 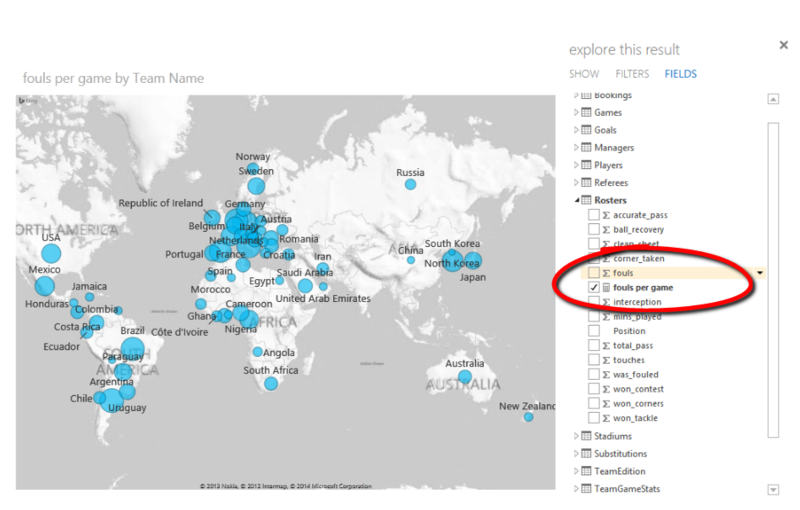 You can modify the type of visualization being used by clicking on the right side menu. This menu also includes filters and the fields available in the model, highlighting the ones being used in the current visualization. Select for example ‘map’ and you get fouls by country in a map instead of a scatterplot. If one of you questions brings back an almost correct answer, it might not seem like the “best” experience. Q&A should magically work on any type of question. However, Natural language processing is still in its early stages as a technology, and we are working on improving it every month (beauty of being a cloud-based SaaS…monthly iterations). Use the filter/field panes to *tweak* your result. 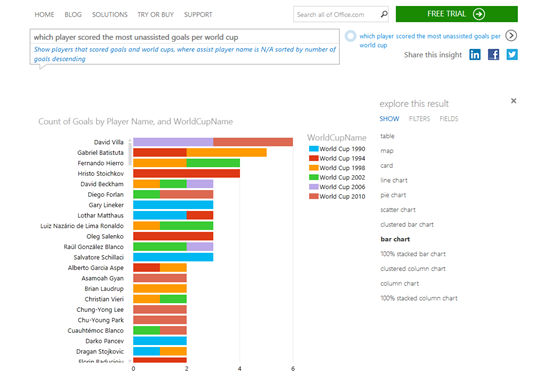 Finally, we’ll be doing an open demos of the World Cup Q&A today, 5 PM at the Microsoft Store in Bellevue Square WA. 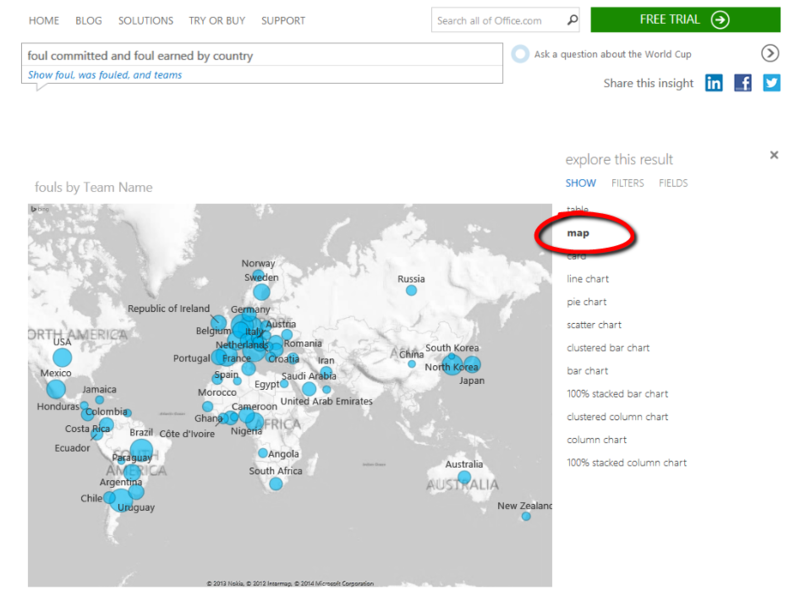 If you happen to live in the area, stop by to experience this Q&A experience in the store with our Power BI experts.